McAllen Grace Brethren Church v. Jewell. The Becket Fund for Religious Liberty (n.d.). Retrieved from https://www.becketlaw.org/case/mcallen-grace-brethren-church-v-jewell/. McAllen Grace Brethren Church v. Jewell. (Apr. 04, 2019). https://www.becketlaw.org/case/mcallen-grace-brethren-church-v-jewell/. "McAllen Grace Brethren Church v. Jewell." The Becket Fund for Religious Liberty. Accessed [Apr. 04, 2019]. https://www.becketlaw.org/case/mcallen-grace-brethren-church-v-jewell/. What would you do if an undercover federal agent came into your church service, confiscated your communion wine, and threatened you with criminal prosecution? Sound crazy? Not if you are Native American. 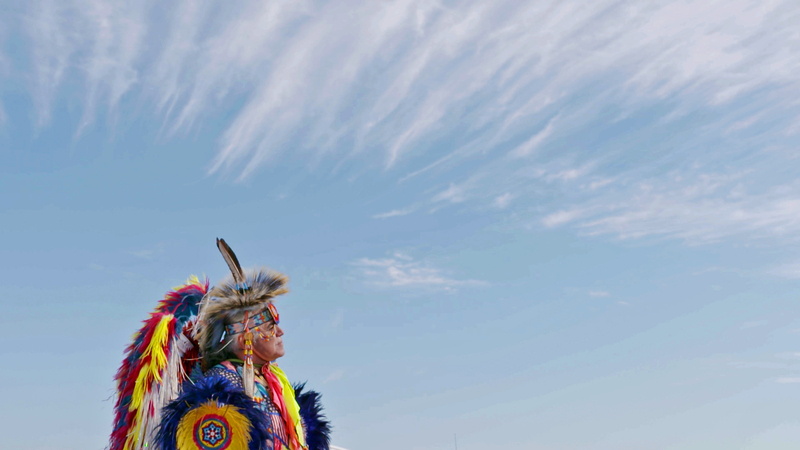 Robert Soto is an award-winning feather dancer and Lipan Apache religious leader. In 2006, he attended a powwow – a Native American religious ceremony involving drumming, dancing, and ceremonial dress. But an undercover federal agent infiltrated the powwow and cut the celebration short when he noticed that Pastor Soto and others possessed eagle feathers. Pastor Soto is a member of the Lipan Apache Tribe, which is recognized by historians, sociologists, and the state of Texas – but not by the federal government. Thus, while millions of other Americans are allowed to possess eagle feathers, Pastor Soto – a renowned feather dancer and ordained religious leader – was not. With the help of Becket, Pastor Soto challenged this arbitrary law in federal court, arguing that it violated the Religious Freedom Restoration Act. Relying on the U.S. Supreme Court’s decision in Hobby Lobby, the Fifth Circuit Court of Appeals ruled in favor of Pastor Soto in 2014, stating that the federal government failed to adequately justify this restriction on religious freedom. Soon after, the federal government entered a historic settlement agreement with Pastor Soto and over 400 members of his congregation. 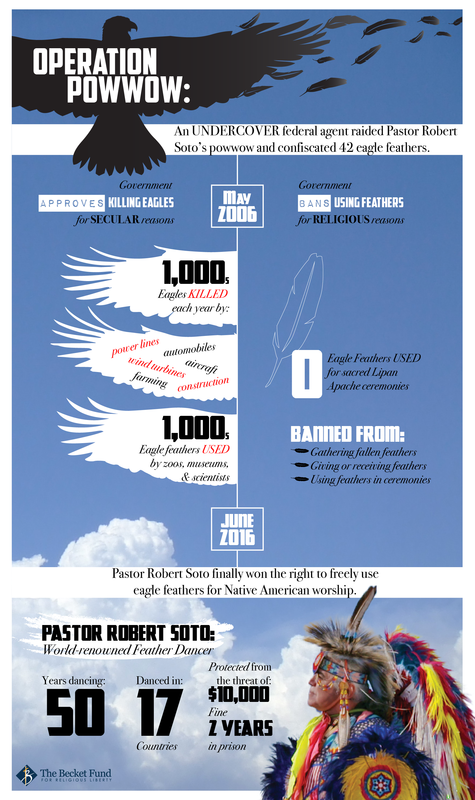 The agreement recognizes their right to freely use eagle feathers in observance of their Native American faith and promises that the government will reconsider its policies for enforcing feather restrictions in the future. For over a decade, Becket has actively defended the religious freedom of Native Americans. We currently represent members of the Klickitat and Cascade Tribes of the Yakima Nation in a case that calls government bureaucrats to account for the desecration of sacred burial grounds. We have urged government officials to protect the right of Native Americans to wear long hair or a symbolic headband in accordance with their faith. We have also filed legal briefs defending the right of Native American tribes to practice centuries-old religious ceremonies at sacred sites like the Medicine Wheel and Devil’s Tower National Monument in Wyoming. Individual Freedom: Individual religious exercise encompasses more than just thought or worship—it involves visibly practicing the signs of one’s faith. Religious individuals must be free to follow their faith in all aspects of life, especially religious minorities whose faith are particularly at risk for discrimination at the hands of the government.